People just can’t seem to agree on the latest viral illusion to hit the internet! 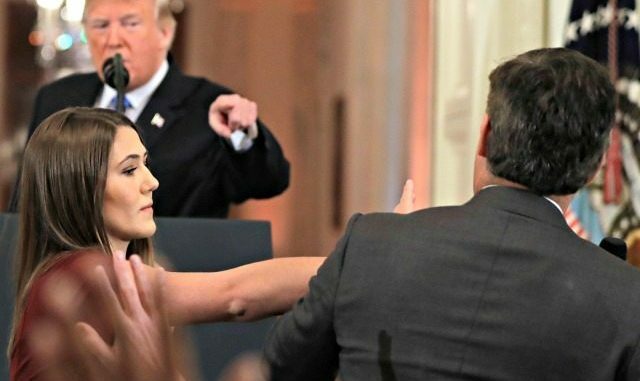 In much the same fashion as “The Dress” and Yanny/Laurel, the video of Jim Acosta’s interaction with a White House intern during a news conference yesterday has viewers in a frenzy, with some seeing a benign brush of the arm, and others seeing an all-out physical assault. In the video, Trump asks a determined Acosta to stop speaking, prompting the intern to retrieve the microphone. Jim refused to give it up, and what followed has sparked debate across the web! He did nothing wrong tho, when she grabbed it he lightly touched her, the fact he is no longer allowed in the White House as a result of this is mad. He was doing his job, asking the president questions. It’s a natural reaction when someone tries to take something from you. You try to stop that person like that. I don't think he swatted, looks more like she reached under his arm trying to grab the mic while he was gesturing downward.